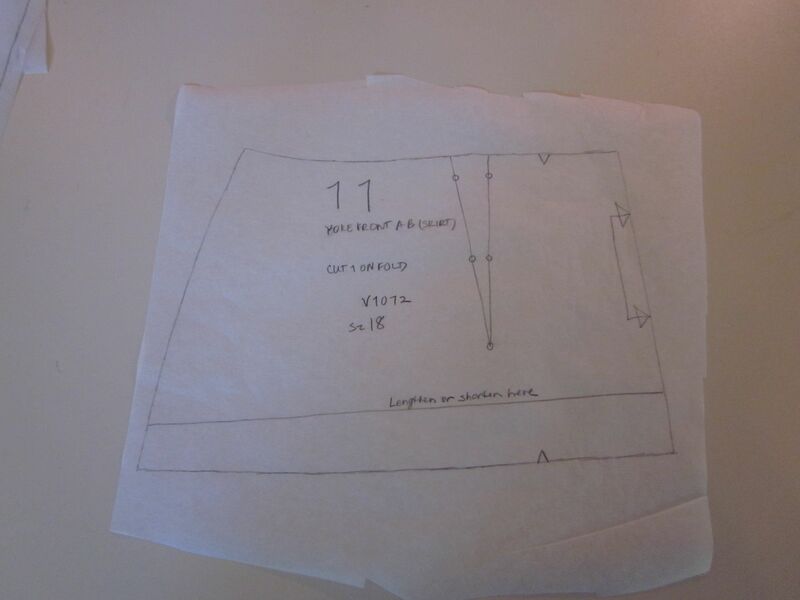 Today I traced my pattern pieces, cut them out in muslin and started sewing them together. The muslin process not only revealed that the waist is too small (expected) but that the best way to allot for that is just to release the front darts. With my straight figure, the “in-seam darts” at the side are enough to fit the skirt to my shape. I’ll be keeping the darts in the back as well. I also figured out how I want to attach the lining. The skirt has a fairly deep yoke that goes from the waistband to the hip. The seam at the hip is supposed to be pressed down. I’ll use my lining fabric to underline the yoke, then attach the skirt and lining at that hip line by sandwiching the yoke between them. That should make for a nice finish inside. The next step will be to rescoop the waist seam on the yoke where I have eliminated the darts and to alter the waistband to fit. The waistband may not need too much alteration. It is set up to be used with an extension for snaps, but I’m going to do a lapped zipper insertion.